Rapid movements of sliding rocks separated from the underlying stationary part of the slope by a definite plane of separation are designated as landslides in the stricter sense. A Creep is a slow and long-term deformation of slopes usually not occurring along one distinct sliding surface but within a thick zone consisting of a system of partial sliding planes. (a) Single house or entire settlement. (b) Agricultural and forest lands. (c) The operation of quarries and exploitation of mineral deposits. (d) Communication under construction or in use. (f) Functioning of submarine cable interrupted by subaqueous slide. (g) Water sewage, gas conduits, telephones and electrical lines. (h) Hydro technical work (Dam construction). (j) Reservoirs, contributing to their silting by material slid down of their banks. 4. Changes in water content. (c) Desiccation & shrinking of soils. (d) Abrupt changes in water level. (c) Washing out of fine sand and silt particles. 8. Changes in the vegetation cover of slopes. 3. 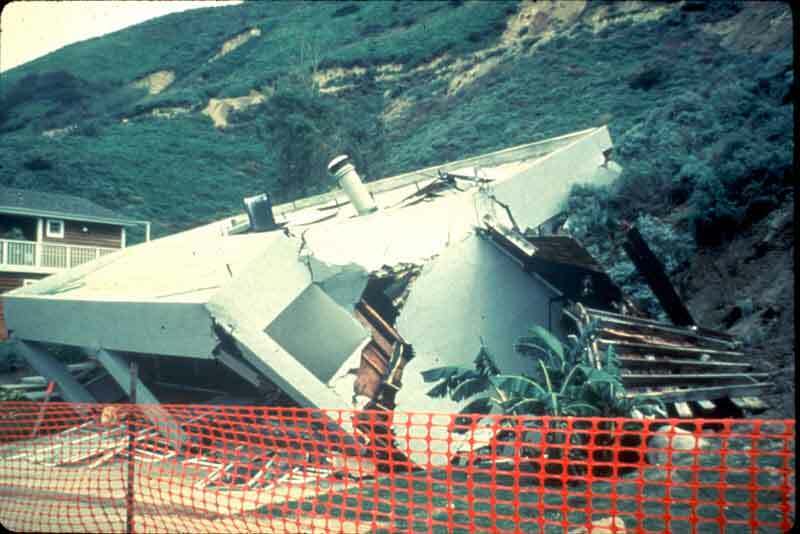 Subsidence: Downward displacement of superficial earth material without a free surface & horizontal displacement. 1. All streams and temporary watercourses should be prevented from entering the area. 3. Open ditches of adequate dimensions & gradients are excavated for discharging rainwater. 4. Ditches encircling the head scarp area to divert the water. 3. Fire brigade pumps if water reaches surface. (ii) Good only for <200mts. K = Total force in the rock bolt. W = Total weight of the slip surface. If two electrodes inserted into the soil the water contained in the soil migrate towards cathode. Landslide 1.-The 1983 Thistle landslide at Thistle, Utah-This landslide began moving in the spring of 1983 in response to groundwater buildup from heavy rains the previous September and the melting of deep snowpack for the winter of 1982-83. 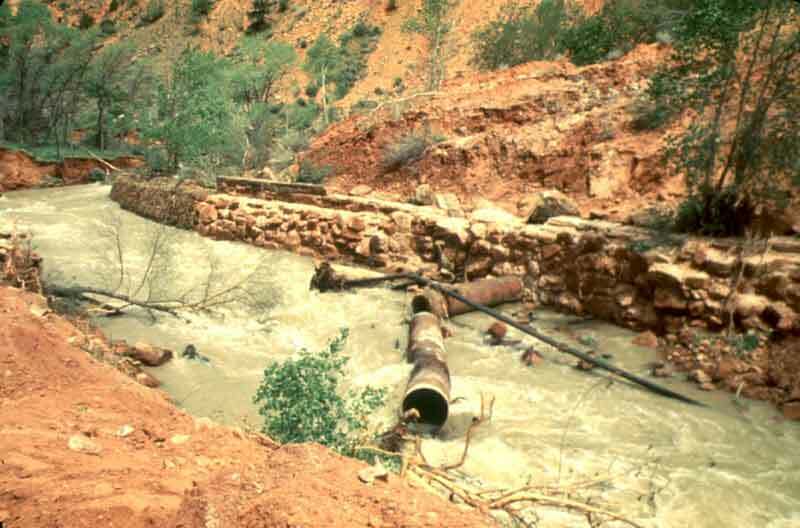 Within a few weeks the landslide dammed the Spanish Fork River, obliterating U.S. Highway 6 and the main line of the Denver and Rio Grande Western Railroad. The town of Thistle was inundated under the floodwaters rising behind the landslide dam. 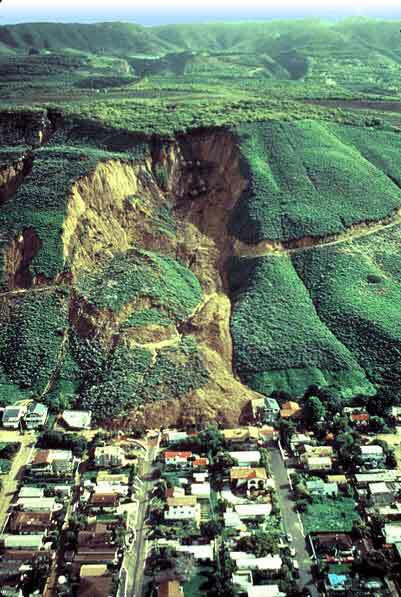 Total costs (direct and indirect) incurred by this landslide exceeded $400 million, the most costly single landslide event in U.S. history. Landslide 2.-The Mamayes, Puerto Rico, landslide, 1985. 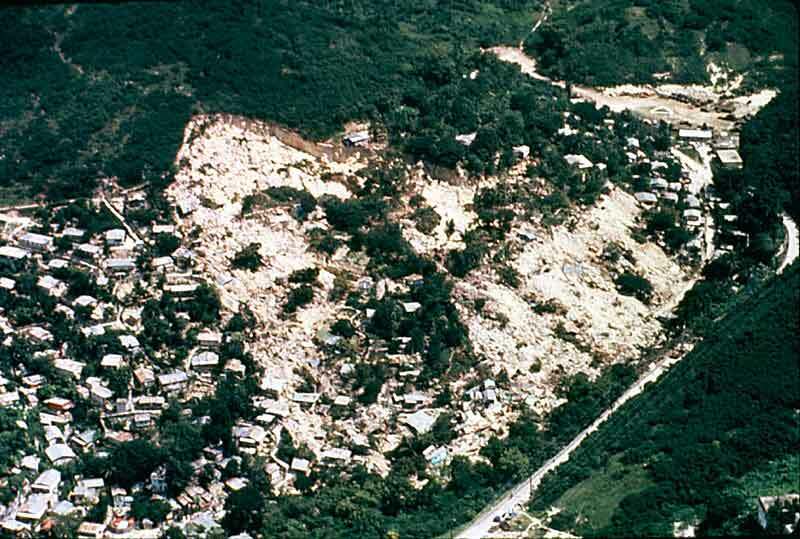 This landslide destroyed 120 houses and killed at least 129 people, the greatest number of casualties from any single landslide in North America. The catastrophic block slide was triggered by a tropical storm that produced extremely heavy rainfall. Contributing factors could also have included sewage directly discharged into the ground in the densely populated area, and a leaking water pipe at the top of the landslide. Landslide 3.-Rock and snow avalanche, Mount Huascaran, Peru. 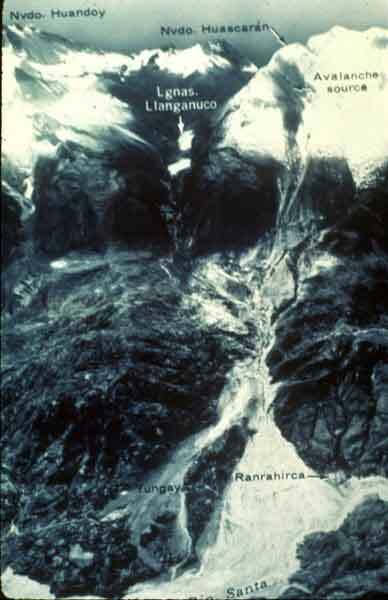 In 1970, an earthquake-induced rock and snow avalanche on Mt. Huascaran, Peru, buried the towns of Yungay and Ranrahirca. The total death toll was 66,000. The avalanche started as a sliding mass of glacial ice and rock about 3,000 feet wide and one mile long. The avalanche swept about 11 miles to the village of Yungay at an average speed of more that 100 miles an hour. The fast-moving mass picked up glacial deposits and by the time it reached Yungay, it is estimated to have consisted of about 80 million cubic yards of water, mud, and rocks. Landslide 4.- Deposits path of the Mt. Huascaran, Peru, rock and snow avalanche. Landslide 5.-The Madison Canyon landslide near Yellowstone Park. 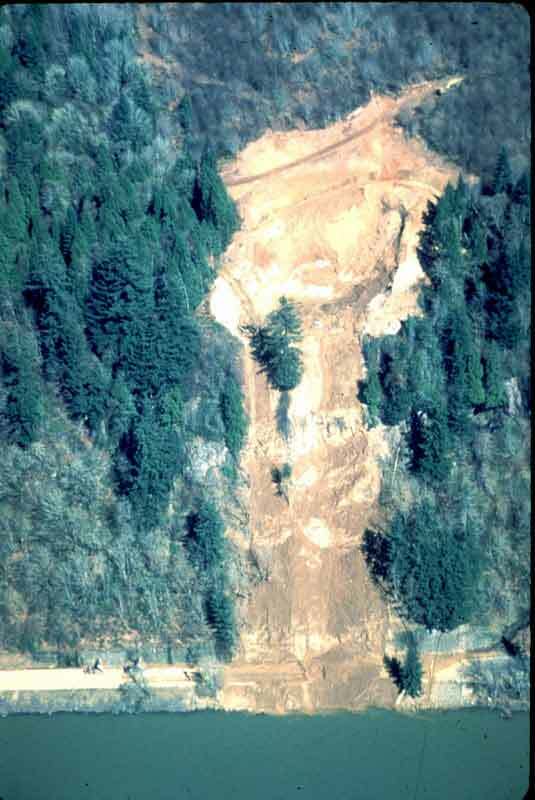 This landslide occurred after the Hebgen lake earthquake (Richter Scale Magnitude = 7.5) in Montana, in 1959. The earthquake caused a great slide of rock, soil, and trees to fall from the steep south wall of the Madison River Canyon. Twenty-eight people camping in the area were killed as they were overtaken by this 21 million cubic meter mass. 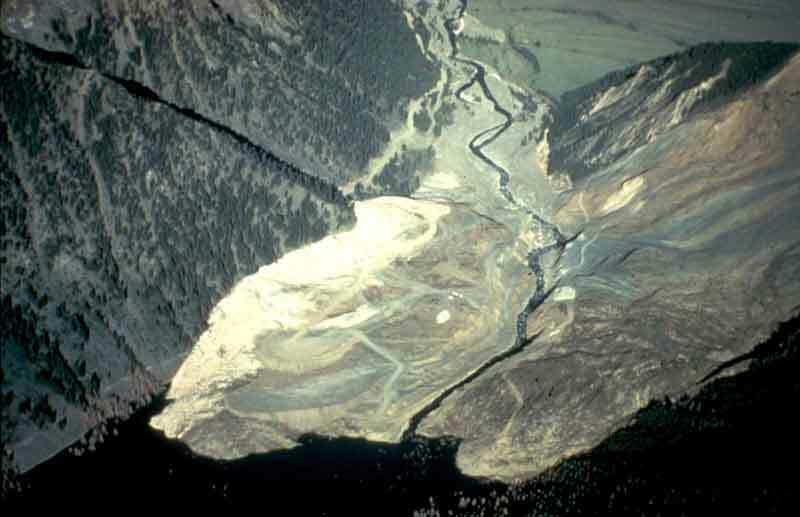 The landslide formed a barrier that completely blocked the gorge and the flow of the Madison River, and created a lake. 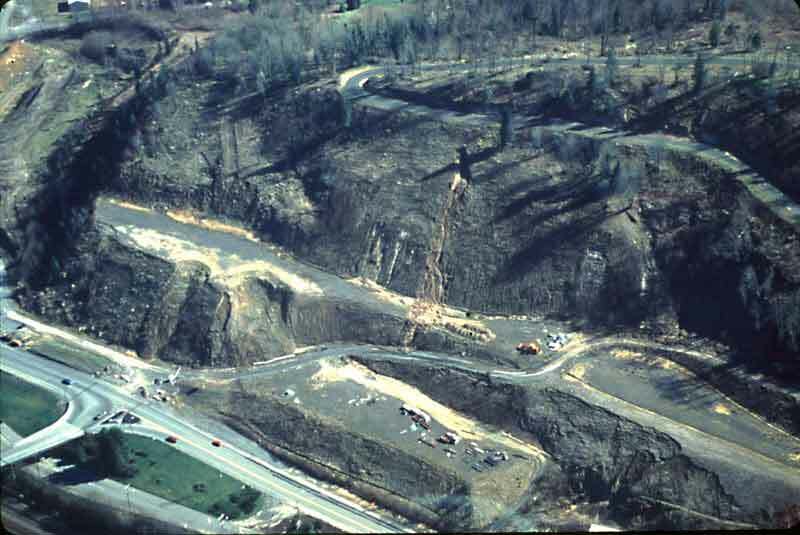 Landslide 6.- Earthflow in Cincinnati, Ohio-This slide shows material being removed by highway crew along the Columbia Parkway, Cincinnati, Ohio. Hamilton County, in the metropolitan Cincinnati area, experienced an average annual economic loss of $5.80 per person (1975 dollars) between 1973 and 1978, the highest calculated per capita loss of any municipality in the United States. 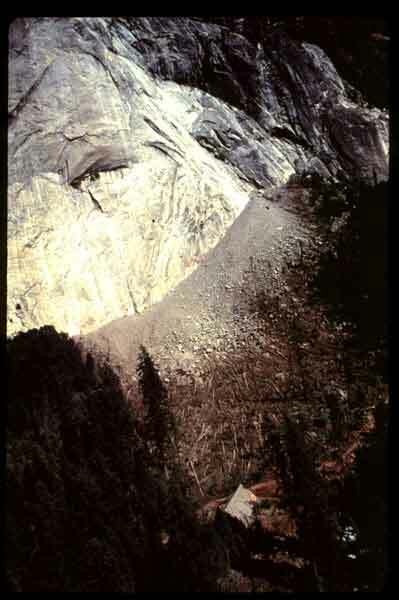 Landslide 7.- Rockfall deposition, Yosemite National Park, California-On July 11, 1996, at 7:00 P.M. (Pacific Daylight Time), a huge rock weighing 200 tons broke away from Granite Point, near Happy Isles, a popular trailhead and concession stand. The rock disintegrated when it landed, creating an air blast that was so powerful that it flattened as many as 2,000 trees in the area. One person was killed at the concession stand, and 14 people were seriously injured. The dust kicked up from the pulverized granite blocked out the sun and coated tents and recreational vehicles, not unlike ashfall from a volcano. Rockfall hazard is a continuing problem at Yosemite, one that the U.S. Geological Survey and the National Park Service are investigating further. Landslide 8.- Sinkhole at Winter Park Florida-Sinkholes, although not classified as landslides, are another form of ground subsidence that can happen catastrophically. 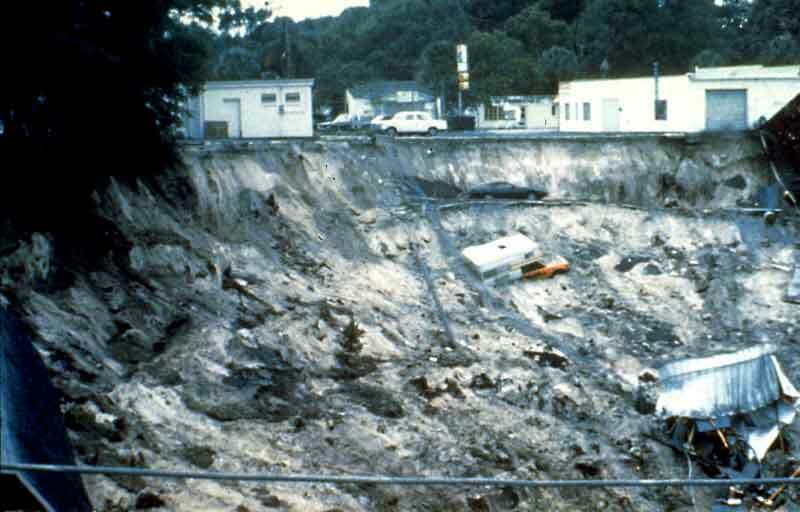 This sinkhole occurred in 1981, in the time span of one day. The city of Winter Park stabilized and sealed the sinkhole, converting it into an urban lake. This form of subsidence occurs when carbonate layers that lie below the surface dissolve. When the weight of the overlying ground becomes too great, or the dissolved area too large, the surface collapses into the void. These features occur in what is known as karst topography which is common in Florida, Kentucky, Missouri, Pennsylvania, and Tennessee and also occurs in many other places around the world. 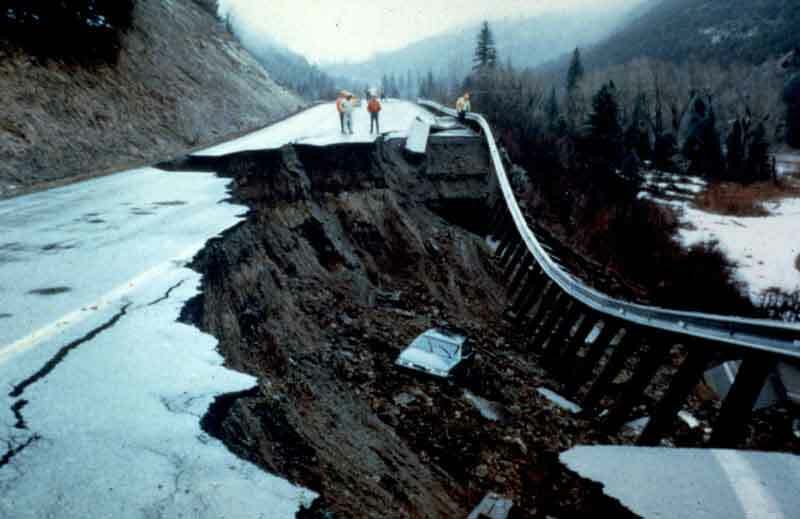 Landslide 9.- A landslide near McClure Pass, Colorado, in 1994-This area of the Rocky Mountains has chronic problems where roads cross landslide areas. The State has found that the best solution in this case, is to repair the road as it becomes damaged. This car plunged into the landslide in the middle of the night, after the landslide occurred. Fortunately, no one was injured. 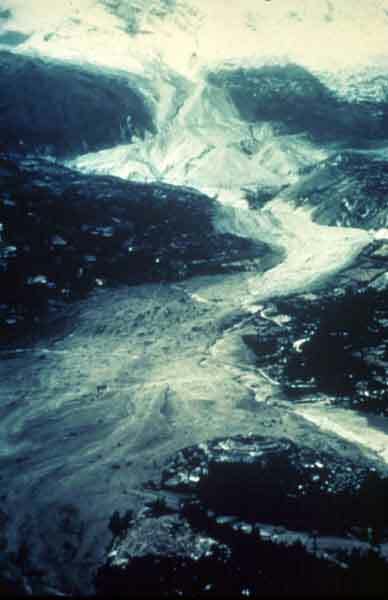 Landslide 10.- Melting snow and ice on the north flank of Washington's Mount St. Helens, triggered this lahar (an Indonesian term for a "volcanic debris flow"), which rapidly traveled down the flanks of the mountain with the North Fork of the Toutle River. 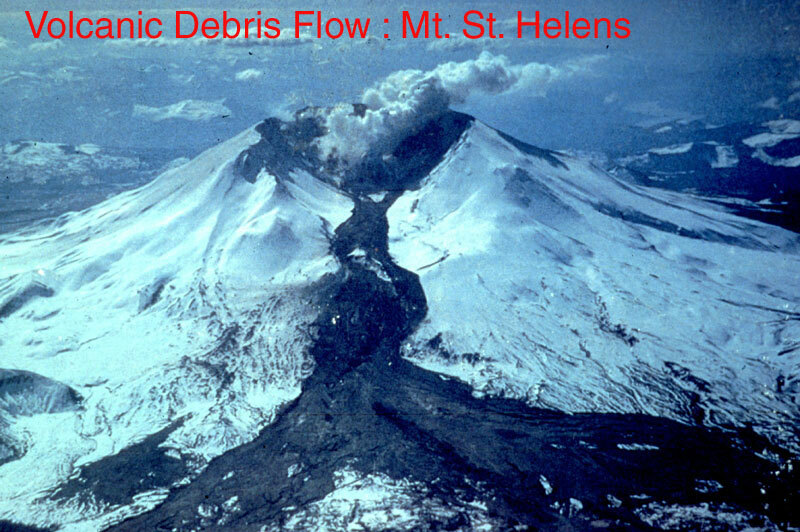 The melting snow and Ice resulted from the 1982 eruption of Mount St. Helens. Landslide 11.- Roadcut failure near Golden, Colorado-This small landslide on Colorado State Highway 93, a well-traveled road from Golden to Boulder, Colorado began sliding in 1993 and cost federal, state and local governments $4 million to evaluate and remedy. Remedial measures included giant tiebacks holding the slide material into the Precambrian bedrock, together with the construction of an elaborate drainage system within the slide. Landslide 12.- Fire-related debris flows from Storm King Mountain, near Glenwood Springs, Colorado. 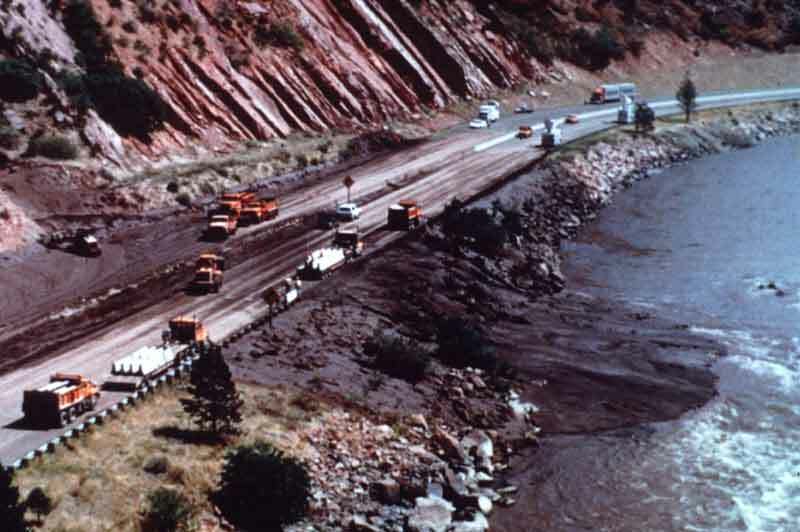 The following three photographs show the results of debris flows that blocked Interstate-70 during Labor Day weekend, 1994. A very hot and fast-moving wildfire in July of that year on the slopes of Storm King Mountain denuded the slopes of vegetation. 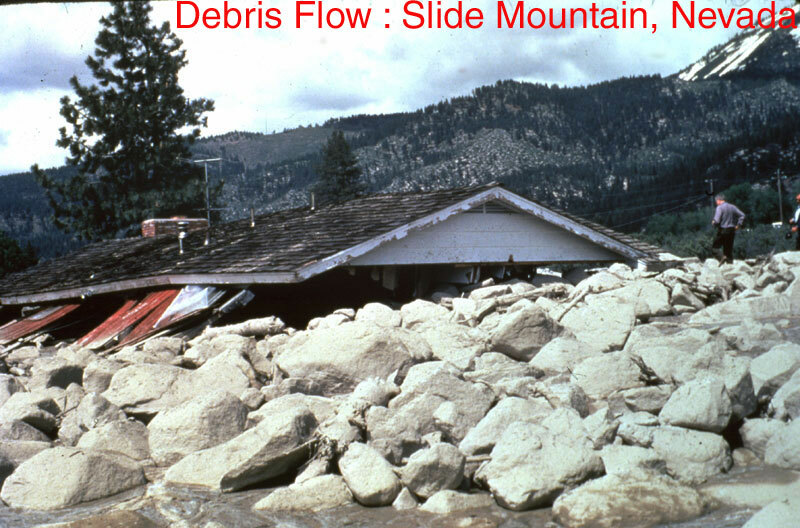 An intense rainstorm generated debris flows from material on the burned hillslopes and in the channels between hills. Interstate traffic was disrupted for a day and caused serious delays for emergency vehicles and hospital access, due to the fact that Interstate-70 is the only access route through this part of the Rockies. The Interstate-70 corridor through the Rocky Mountains experiences numerous problems from landslides, debris flows, and rockfalls. 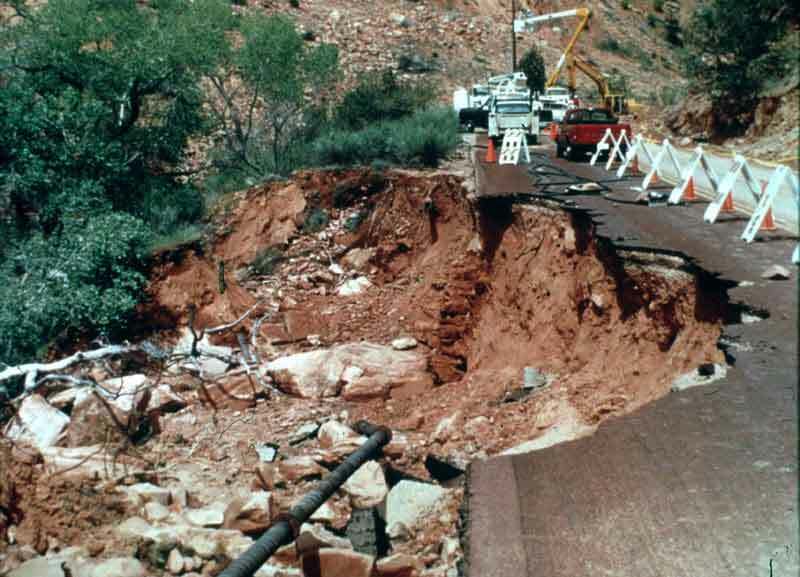 Landslide 13.- Road damage in Zion National Park, Utah from a landslide that occurred in April, 1995. 100 people were stranded for two days in the Zion Park Lodge, because this road was the only access to the lodge. 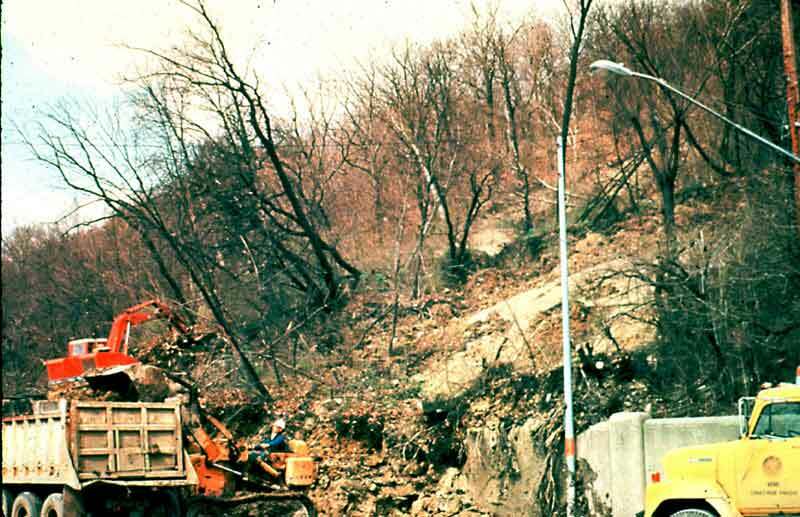 Landslides can damage lifelines as well as block highways, as shown by the damaged sewer line which paralleled the road. Landslide 14.- Another view of the Zion Park landslide. 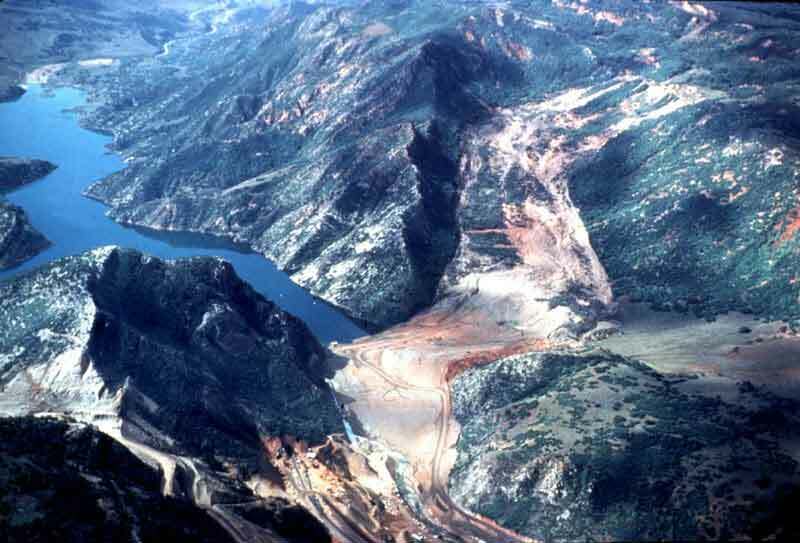 Landslide 15.- An oblique air photo of the Slumgullion earthflow in the San Juan Mountains, near Lake City, Colorado. This landslide which occurred about 700 years ago, is more than 7 km long, and is still moving, although very slowly. It has been continually studied over the years by the U.S. Geological Survey and others and has provided much technical information on landslide mechanisms. 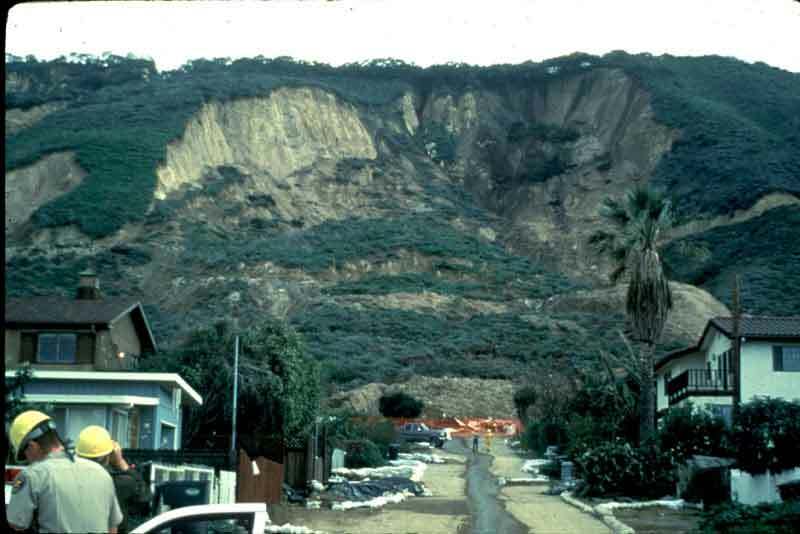 Landslide 16..- La Conchita, California-a small seaside community along Highway 101 north of Santa Barbara. This landslide and debris flow occurred in the spring of 1995. 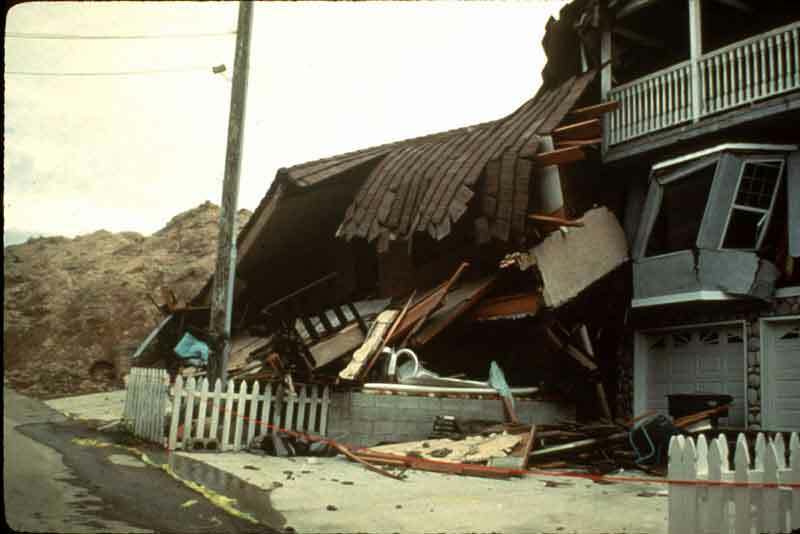 Many people were evacuated because of the slide and the houses nearest the slide were completely destroyed. Fortunately, no one was killed or injured. 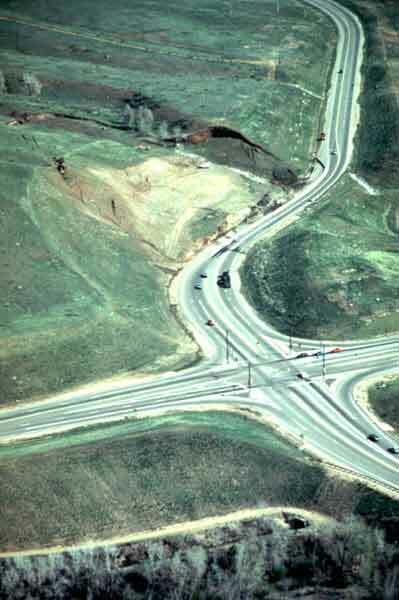 Landslide 17.- La Conchita, California, ground-level view, looking down a road, towards the toe of the slide. 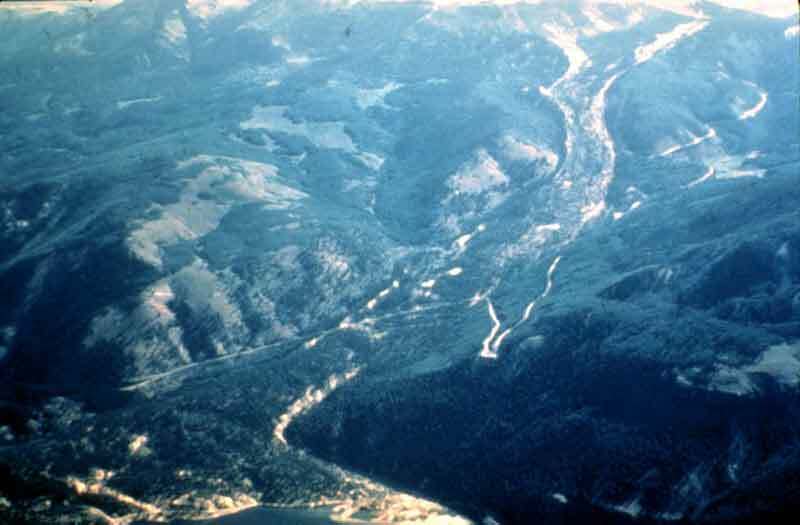 Landslide 20.- Slide 25 and Slide 26 show effects of landslides and debris flows during the winter storms of February 1996 in the northwestern United States. Areas of highest rainfall intensities were centered along the Oregon-Washington border. Estimates of damage from the floods and landslides exceeded $800 million in Washington and Oregon alone. This slide shows a failed residential development on a hisllside at Chehalis, Washington. Much of the failure occurred in years immediately before 1996. Landslide 21.- Landslide in marine sediments over basalt, extending across Washington State Highway 4, into the Columbia River, west of Stella, Washington.